Put the straps, remove them, buckle it, flip it, open and close. Endless possibilities with this gorgeous exclusive bag. 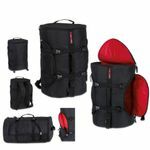 Can be used as a backpack, travel bag and has multiple compartments. This one is for the serious traveller. Made with premium materials with lots of space and buckles.